A. Actually, it will do a much better job because the system waters automatically, placing exactly the right amount of water on individual lawn and garden areas. It never gets too busy to water properly and it never forgets to turn off the water at the appropriate time. Q. Will the system use more water than I’m currently using? A. No. In fact, it actually will conserve water while doing a better job of watering. You’ll never have to worry about runoff from over-watering or wasting water when you forget to turn off the hose. Furthermore, with our rain or soil moisture sensor, your system will know when it’s raining, or if the ground has sufficient moisture. It will simply shut itself off whenever water is not needed. Q. Will having a sprinkler system really save me time and effort? A. Yes. 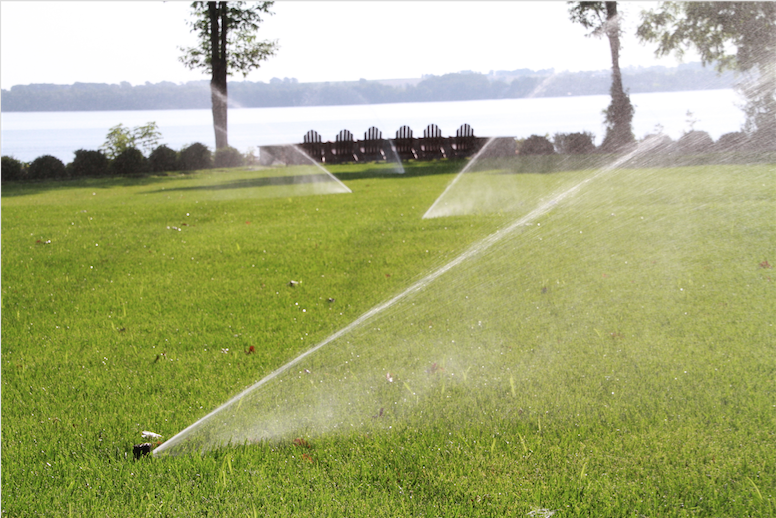 Having an automatic sprinkler system means never having to spend another minute of your valuable time watering the lawn. Your new system will do all of the watering for you, even when you’re away from home. You’ll be able to simply forget about watering and spend your time doing the things you really like to do. Q. We get plenty of rain in Rochester. Do we really need a sprinkler system? A. If it rained at your house every three days, the same exact amount each time, you probably wouldn’t need a sprinkler system. But nature doesn’t work that way. In the dry season when there is little or no rain, your yard can suffer damage after just a few days without water. The only way to ensure healthy, lush growth is to make certain your lawn and plants receive a regularly timed, evenly measured amount of water. A. Irrigation Tech offers custom designed underground automatic sprinkler systems from all the major irrigation manufacturers, including Rain Bird, the largest manufacturer of irrigation systems in the world. Irrigation Tech has extensive knowledge in horticulture, landscaping, and irrigation systems. Our staff has spent years developing their specialized skills and knowledge needed to guarantee a job well done. This expertise enables us to analyze factors such as water source and pressure, soil type, planting materials and weather conditions, all of which must be considered in order to determine the ideal system for your needs. It’s important to remember, an irrigation system must be customized to meet specific site requirements because every landscaping situation is different. Q. Can I save money by installing the system myself? A. In most cases, the answer is NO! In fact, it could cost you much more money in the long run. Trust us to design and install the most cost effective and energy efficient system possible. We understand and give special attention to such significant factors as sprinkler patterns (it is very important to overlap the patterns so the outer edges receive sufficient water for healthy growth) and backflow prevention (which is necessary to protect your drinking water supply and required by the NYS Health Dept.). Furthermore, because we’re experts in local plumbing and electrical codes, you won’t have to worry about costly mistakes in wiring or pipe installation. Q. Will the installation damage my lawn? A. No. There is virtually no damage done to your turf, thanks to a special machine called a vibratory plow. This non-destructive procedure allows us to lay plastic pipe underground without digging ditches and causing havoc with your landscape. See here. Q. Will the system be too complicated for me to operate? A. Today, automated sprinkler systems are very easy to operate. We will set the system’s controller to fit your individual water schedule; then all you have to do is sit back and let the system do all the work for your. Should you need to change the watering schedule, there are easy instructions on the inside of the controller. Of course, Irrigation Tech support is just a phone call away and we are more than happy to help answer your questions. Q. Will the installation damage my buried cable TV or telephone lines? A. No. One of the first two things that we will do upon arriving on your site is track your cable and telephone. Every truck in our fleet has a very sophisticated device for sending an audible signal down wires which can then be tracked with our second device which hears that signal. As the technician tracks the wire, he marks it with either paint or flags. This way we know exactly where the line is which we need to avoid.